Looking for a quick, inexpensive or free way to use things you already have and give your fireplace mantel an updated Christmas arrangement? Bring out the glassware and fill ’em up. 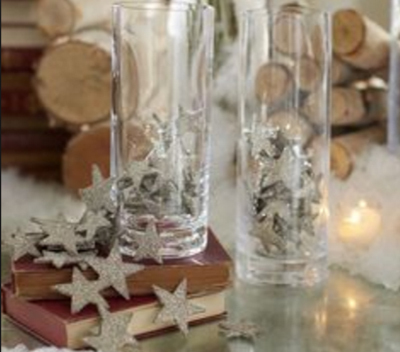 Filling glassware can create beautiful, festive arrangements of color. 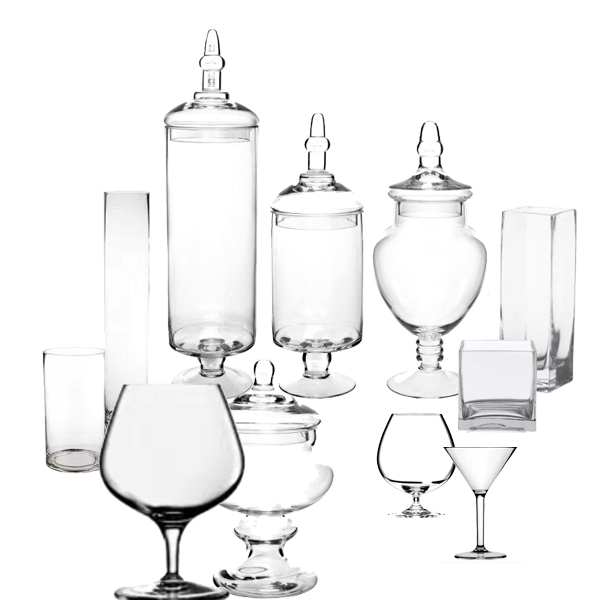 The unifying element of your collection is that everything will be clear glass. So, for step one, gather one or more of all the shapes of crystal and glass you have on hand, the more varied the shapes, the more interesting the fireplace mantle display will be. Use glassware such as cylindrical vases, apothecary jars, square vases, brandy snifters and martini glasses to decorate your fireplace mantel at Christmas. Cranberries. A lovely holiday red, they are nature’s gift for decorating in red! For large containers, insert a similarly shaped but smaller glass inside the larger one. Then fill in the space between the inside glass and the outside one. It gives the appearance the whole large container is filled with cranberries, but it only requires a fraction of the number of cranberries. Pine cones. Another of nature’s gifts! Gather all sizes of pine cones. 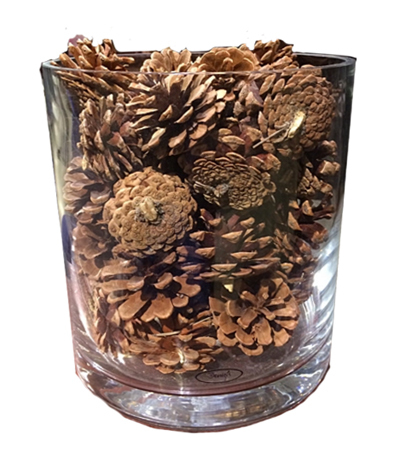 Fill up your glassware with them, using small pine cones to fill in around larger ones. If their natural color doesn’t coordinate well with your room, or if you want a more formal look than they naturally provide, you can spray paint the pine cones first. Decorating a fireplace mantel for Christmas with glass filled with pinecones. Candy canes. 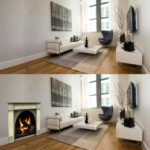 The red and white ones are a classic, but the green and white or the red, green, and white ones might work best in the room in which your fireplace mantel is located. You can also use candy-cane striped ball candies. One great thing about candy canes is that they seldom go to waste! After the holidays, they still appeal to the sweet tooth. 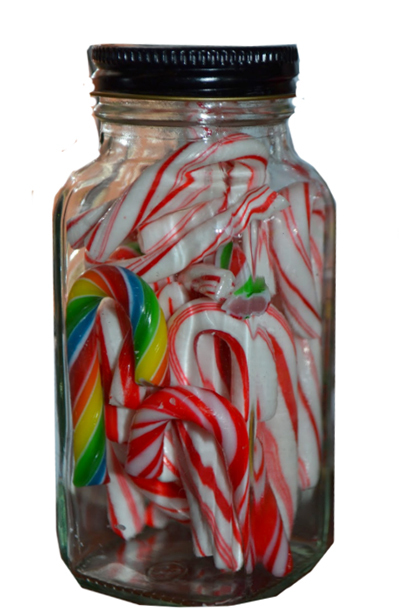 Decorating a fireplace mantel for Christmas with glass jar filled with candy canes. Christmas Balls. 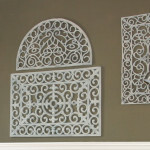 These have the advantage of coming in just about any color your decor needs! 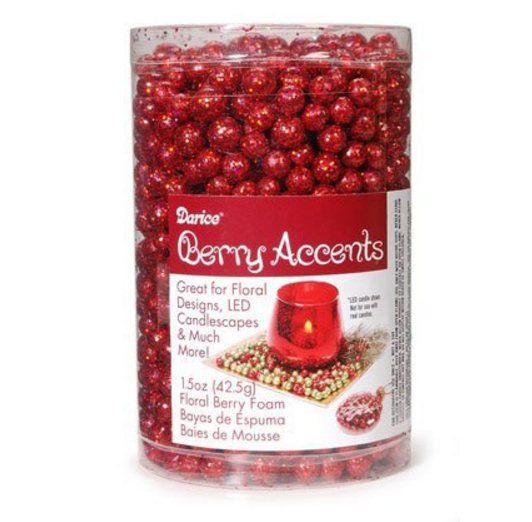 Dollar stores often have boxes of Christmas balls, so you can stock up for just a few bucks. Consider the effect you want to create. Will balls all one color (though maybe in a matte and a shiny finish) work best? Or maybe a mix of two colors? Get creative and experiment. Christmas Gift Wrap Ribbons. Turn what would be scraps into an eye-catching fireplace mantel display. Loosely pack your glassware with a jumble of colored ribbons, letting them curl out over the edges and dangle onto the mantel. Two or more colors of ribbons work best, and having a variety of textures of ribbons including lacy ribbons and metallic ribbons gives the display more interest. Greenery. Bits of holly and evergreens are lovely in glassware. Arrange them as bits inside the containers or use each container as a vase with the greenery arranged just as you would make a flower arrangement. Use snippets of greenery from your yard or trimmings from stray Christmas tree branches. 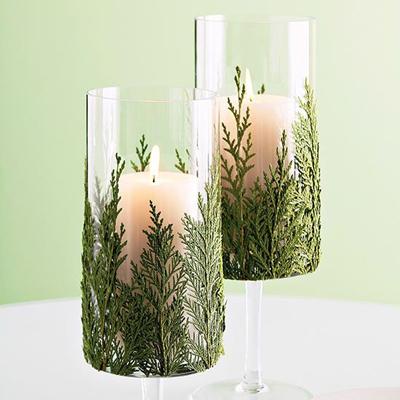 Christmas greenery and candles in glass. Red and Green Apples. Apples not only look great, come in traditional Christmas colors, and are available in a variety of sizes, they also have a great smell! Plus, they last and last, and can be “recycled” into snacks after Christmas. 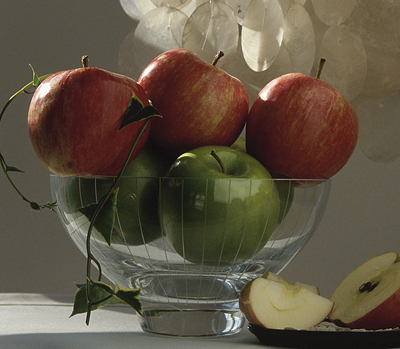 Or you can create your decorations with artificial red and green apples. Tinsel. Really wanting to add a bit of flair? 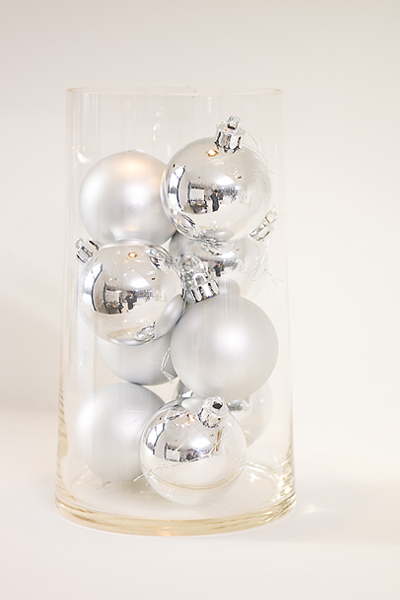 Fill a jar with tinsel to make your decorations shine. For even more sparkle, add some Christmas lights. The third step is to decorating a fireplace mantel for Christmas with glass is to arrange the filled glassware on your fireplace mantel. Think layering, overlapping the glass containers. 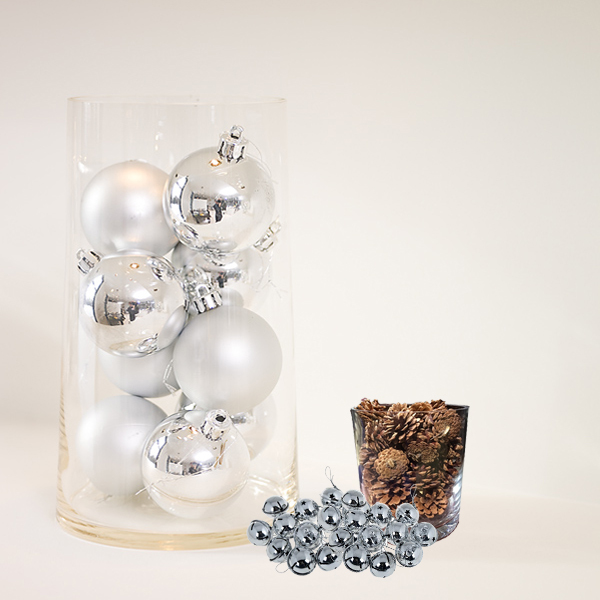 Fill in around their bases of the glassware with…what else!…more of the same: more pine cones around the glasses filled with pine cones, more presents around the glasses filled with presents, more Christmas balls around the glassware filled with Christmas balls. For the final step, think “accent.” Scatter one of the elements you have not used amid your filled glassware. For example, around and between glasses filled with candy canes, entwine ribbons; tuck in bits of holly or evergreens amid your display of Christmas balls in glass containers; or accent your cranberry-filled glassware display with a scattering of pinecones. 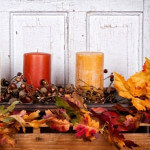 Candles are another excellent choice for the “accents” when decorating the mantel for Christmas. Finally, a string of lights intertwined between the glass will make the whole mantel sparkle and shine. 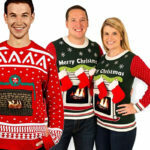 Looking for some great hearth decorations or gifts? Browse our hearth décor and gift sets. Last updated by Tom at October 16, 2016 . ‹ Show Us Your Fireplace Decorations!